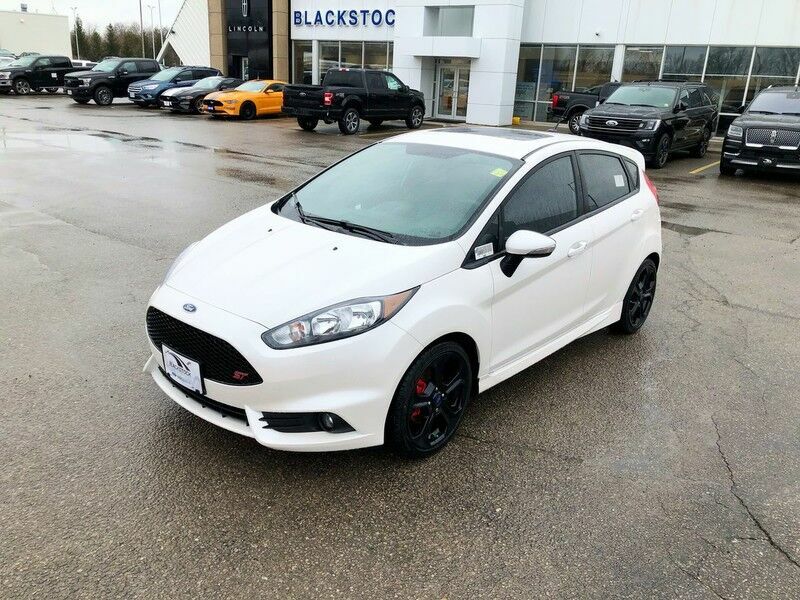 ** PRICING INCLUDES $349 FOR 3M COLOUR STABLE WINDOW TINT ** Embrace Turbo power in our White Platinum 2019 Ford Fiesta ST Hatchback! Powered by a TurboCharged 1.6 Litre 4 Cylinder that offers 197hp while matched to a 6 Speed Manual transmission and sport-tuned suspension to provide agile handling. This Front Wheel Drive offers near 7.1L/100km on the open road. Boasting incredible driving dynamics paired with ultimate comfort, our ST adds more fun to each day with its ability to turn heads with the bold styling. Check out the dual exhaust tips, a chrome grille, unique wheels with summer performance tires and a rear spoiler. Check out our ST photos, and you'll see the cabin abounds with modern features and technology! Ford's SYNC 3 communication and entertainment system will keep you in touch and in tune with all the latest news, weather and music. Easy-to-use controls, a quality sound system with Sony speakers and HD radio, extra power points for electronics, ambient lighting, comfy upgraded cloth bucket seats, and a leather-wrapped tilt and telescoping steering wheel are just a few of the great features you can expect. With excellent safety scores, our Ford Fiesta boasts AdvanceTrac electronic stability control, seven airbags, a tire pressure monitoring system, four-wheel anti-lock brakes, hill launch assist and Ford's SOS post-crash alert system. No matter how you slice it, our ST is a smart, lively car that is fun to drive and saves you money at the pump. It may be the best choice you've made all year. Print this page and call us Now... We Know You Will Enjoy Your Test Drive Towards Ownership! Blackstock is proud to be a premier Ford and Lincoln dealership in the Orangeville, Ontario area. From the moment you walk into our showroom, you'll know our commitment to customer service is second to none. Whether you need to purchase, finance, or service a new or pre-owned Ford or Lincoln, you've come to the right place.